Murata Machinery USA’s Fabrication Division, Charlotte, NC, will unveil a new proprietary software-control interface designed to increase operator and machine efficiency and product quality, and to provide tool data tracking for turret punch press and loader systems. Donald Angel, the firm’s lead applications engineer, will be speaking about the intelligent control interface at FABTECH, where he will discuss how the software affects tool setup, turret layout and tool maintenance. Also at the firm’s booth, visitors will spy its new Motorum turret punch press models with improved controls and fresh features. Kicking off the product-wide update was the introduction of Motorum 30, rated to 510 hits/min., with a 33-ton servo-driven ram turret and new Fanuc 31i PB control that contains Murata’s Intelligent Control Interface. 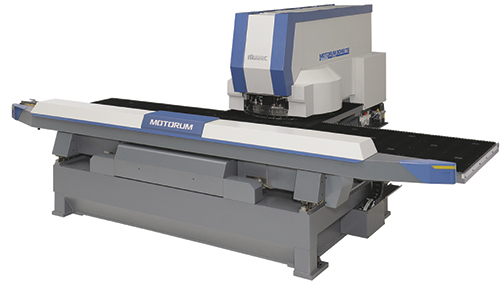 In August, Murata debuted the Motorum 2048TS series, a high-speed 22-ton machine with a 50- by 100-in. table. Included is the latest Fanuc Oi PB touchscreen control and Murata’s Campath TRM programming feature.